Rana, Krish make a cameo in a TV serial! Telugu film celebrities are slowly following the footsteps in terms of how they promote their films. While making appearances on TV shows especially like talk shows and live interviews has become a norm, of late a new trend is emerging in Telugu film industry. Earlier this year, S S Rajamouli had made a cameo in a serial titled Chandramukhi which was aired on ETV. It was the 1500th episode of the mega serial and Rajamouli himself had directed it. Since his film Eega had released just then, his appearance was quite handy in the film’s promotions as well. Earlier today, Rana and Krish did something similar. Both of them made a cameo in an ETV serial titled Putthadi Bomma. 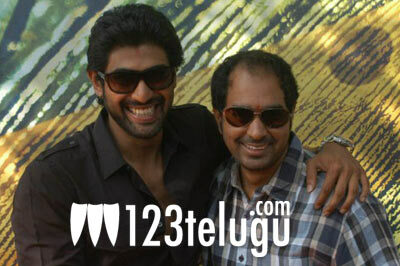 The duo had recently teamed up for Krishnam Vande Jagadgurum and it took a good opening at box office. In its second week, the film is registering decent collections and the film’s team is doing its best to promote the film. Such appearances have become a good hit with the audience as well, but we’ll have to wait and see if it can take off in a big way.